Celebrants light candles, fires, lamps, and turn on all electric lighting, to remind everyone of the blinding grace delivered to all beings by the Pancreator. Each is expected to give presents, symbolizing the reflection of the Empyrean’s grace from one soul to another, Universe without end. It is believed that this date’s coincidence with an ancient Urth festival is evidence of divine synchrony, not a convenience of the Church’s manufacture. Greetings, my new friends. I am pleased to be able to speak with you today. As you know, I was not raised with the sermons of the Prophet and his Disciples on my lips. My spiritual milk was instead the deeds of my ancestors and the spirits of the worlds they walked upon. I am new to the Prophet’s grace, but Pancreator willing, I hope to prove my courage to you all. No darkness shall stand between me and the true teachings of the faith. Let my axe banish all resistance! My people seem so distant from you, strange of ways, dress, and word. And yet, if you walk with our ancestors far, far back into their time, you will find that we were once kindred, citizens of a single commonwealth, thanes of the Republic. And before that, our grand-kin trod the same soil of Holy Terra. Our estrangement is an illusion of time. As we come to see this more clearly, so will our kinship grow and our oathbonds become stronger. I am proud to light the Lux Splendor beacon, a torch that once yearly shoots forth into the night, spreading light and fellowship — and burning the cold hearts of all who serve the Dark! Hail Zebulon, greatest of us all. Pilgrim, it is to the Prophet that we pray when the Dark grows deepest and all hope is lost. Like a lamp in the night, he shows us the way back into the Light. None have seen the Light as did Zebulon, who removed from our eyes the blindfold that the Dark had placed upon us during our long, hard trials from the dirt to the stars. “In 2723, the Prophet saw the Holy Flame.” On that far-flung world, now lost to us, he saw in full the Pancreator’s radiance, and it shone ever forth from the Pancreator’s brow. Humans on their cradle world of Holy Terra had known glimpses of this Light, dimly seen in visions in elder ages. Only now, only through Zebulon’s eyes, was it revealed in full glory: the primal star that burns at the center of all existence, the pole around which all the galaxies orbit. We walk in the Prophet’s footsteps on the trail he blazed through the stellar spaces, traveling along the routes he sanctified with his death, seeking, ever seeking, for some spark of that original Light that he did witness: the Flame Eternal. Pray for Zebulon’s return, that he might bring forth the Light and reignite the stars forever and ever, Universe without end. Storm Knights! 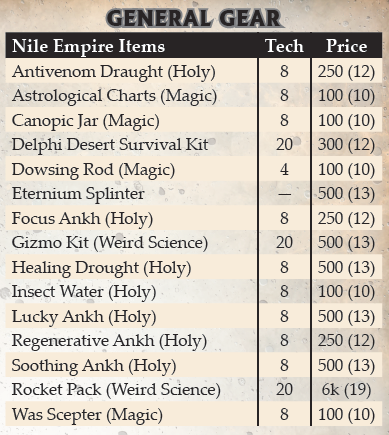 It’s time to tell you what to expect when the Nile Empire Kickstarter launches next Wednesday, November 28th! 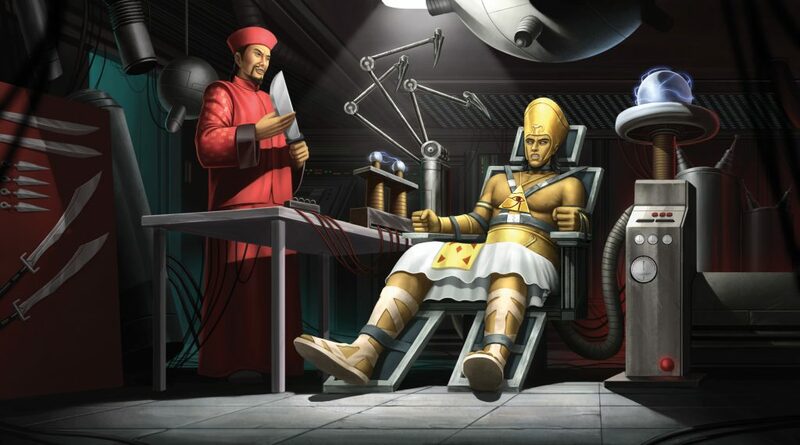 Your most important resource for fighting the forces of Pharaoh Mobius! 144 pages of vital information, available in the standard hardcover, or upgrade any pledge to the blue leatherette Deluxe Edition or indigo leather Limited Edition! When your team is ready, this book of adventure will take you on a journey throughout the region to stop Mobius’ nefarious plot! Can you find a weakness to his ultimate war-machine before it’s campaign of terror destroys all resistance in the region? The best way for GMs and players alike to jump right into the most action-packed cosm! 16 new archetypes and a GM screen specifically designed to have all the most important information right at your fingertips! Make a plan of action now! Includes digital versions of all three products listed above, plus anything digital that we unlock through stretch goals! For only ten dollars more (plus shipping), upgrade your book to physical! Includes digital versions of everything else, including stretch goals. Upgrade all three products to physical! Includes digital versions as well, and stretch goals are still digital at this level. This isn’t just an upgrade, it’s so much more! 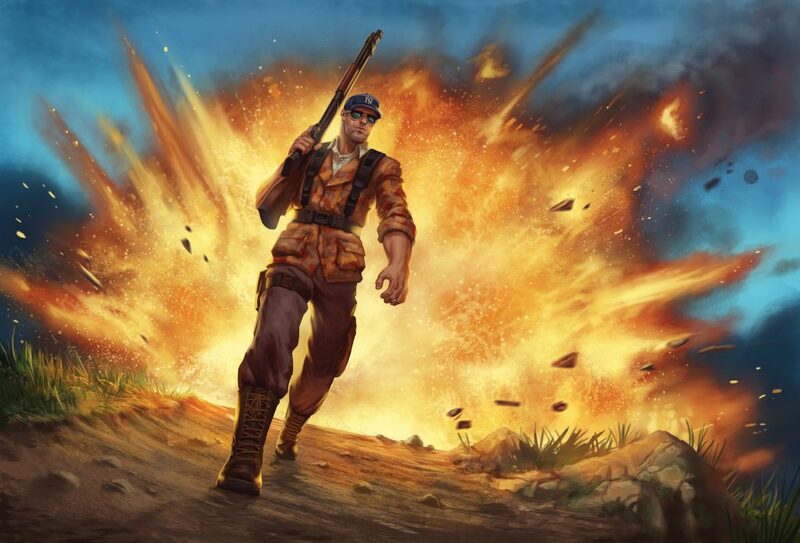 New threat cards and blips, new possibilities, and the Fires of Ra soundtrack! Also includes all physical stretch goals marked with “Sarcophagus,” and of course the digital versions that everyone gets! 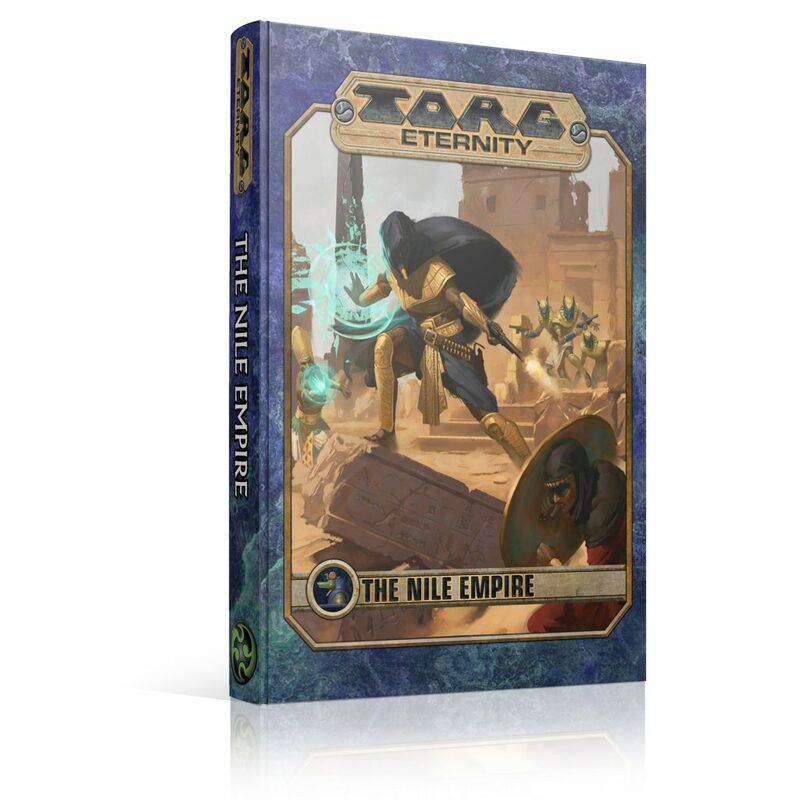 All of this in a sturdy Nile Empire-themed box, as you’ve come to expect from Torg Eternity! Add your Archetype just as Vigilante above, plus you earn a seat for yourself or a designated proxy at our very special GenCon event on Thursday night. Last year’s event was an epic battle that determined the fate of the Mystery Men. What will this year’s game hold? Note that this offer doesn’t include travel, lodging, or tickets to GenCon. The excitement begins Wednesday, November 28th! The Aventuria Magic Kickstarter launches Tuesday, November 13th, at 10am Eastern Time (15:00 UTC)! We’re always working to help make our pledge levels as clear and simple as possible, and this time around we have made it very straightforward. Aventuria Magic Digital – This is exactly what it sounds like. 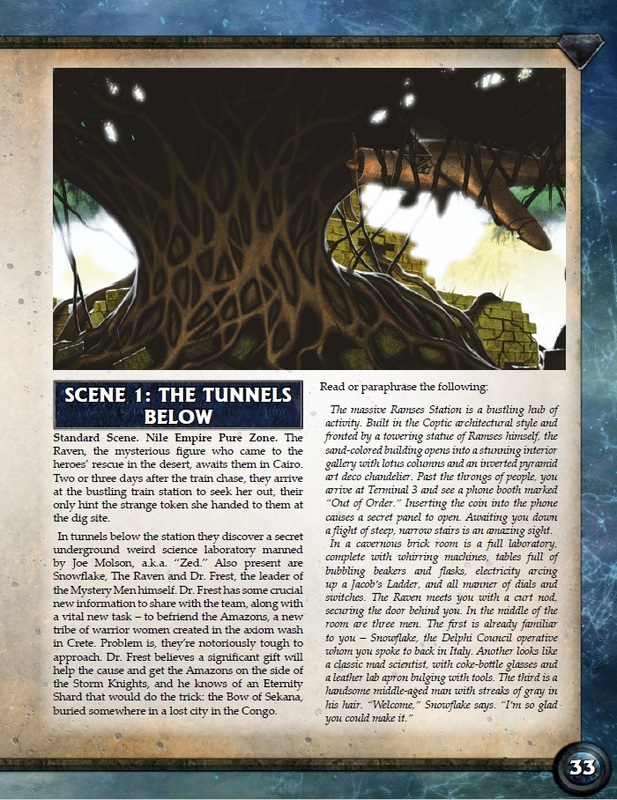 You’ll get the PDF for Aventuria Magic, plus PDFs of Conspiracy of Mages, The Legacy of the Theater Knights, and the Deluxe Character Sheet for Spellcasters. This reward level is a great deal, but it does not come with stretch goals, because we are not doing any digital stretch goals this time around. Our stretch goals are entirely physical. 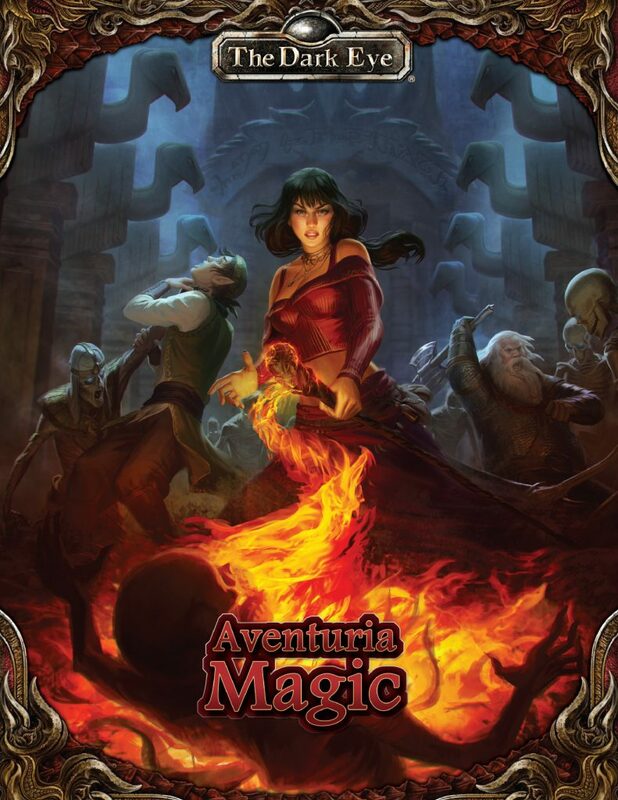 Aventuria Magic Physical – This is actually three reward levels that all look very similar. The only difference is which edition of Aventuria Magic you’re getting – hardcover, deluxe leatherette, or limited handbound leather. 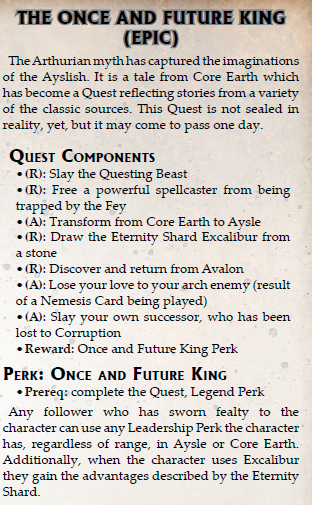 These levels come with the Aventuria Magic book, two card packs of reference cards for the many spells and rituals in Aventuria Magic, the brand new Fate Points Set 3: Magic, and the PDFs listed above. Also, you’ll get all our stretch goals, most of which are designed to enhance many of the products included in these reward levels. 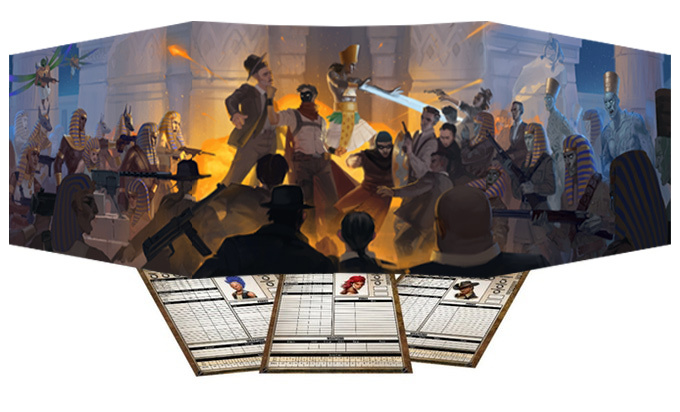 Gen Con Game – Get all the physical rewards (including both a Limited and Hardcover copy of Aventuria Magic), and you get to play a game at Gen Con with celebrity guest player Cody Lewis of Taking20! 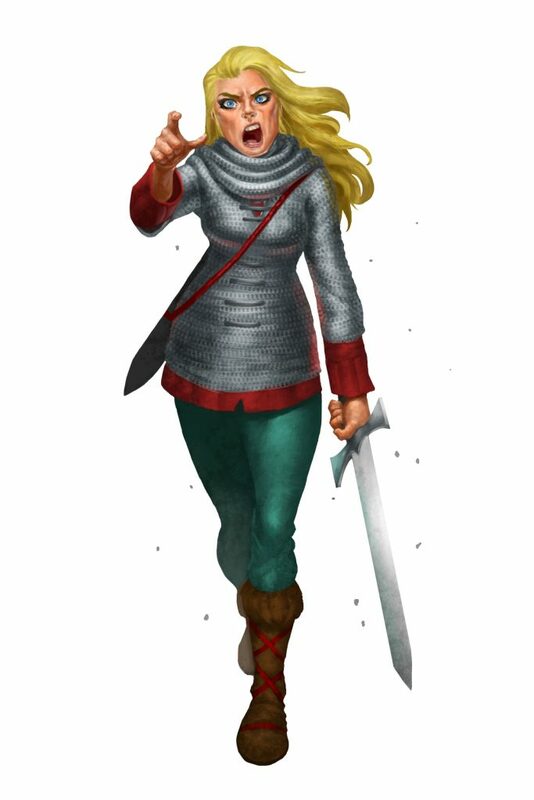 In addition, you’ll get two copies of a character miniature from Westfalia Publishing, one that we will have professionally painted and one for you to paint yourself! As we have mentioned in a few places, our library of available The Dark Eye products has grown too large to include everything as individual add-ons. We’ll decide exactly what will be on the list as we get closer to the end of the campaign, but we’re also trying something new: Add-On Bundles. These bundles are amazing deals to help new players and GMs grab the most useful and important products for the table. Not only will the price of the bundles be marked down, but they will actually get better throughout the campaign! By the time we get to the Pledge Manager, these deals will be too good to pass up! There is no extra shipping charge for the Add-On Bundles, so pick up as many as you like! Expand your magical repertoire with new Traditions, spells, and enchantments! Nearly two dozen profession packages expand options for starting characters, and new focus rules for spell workshops allow mages to develop new and exciting spell effects! 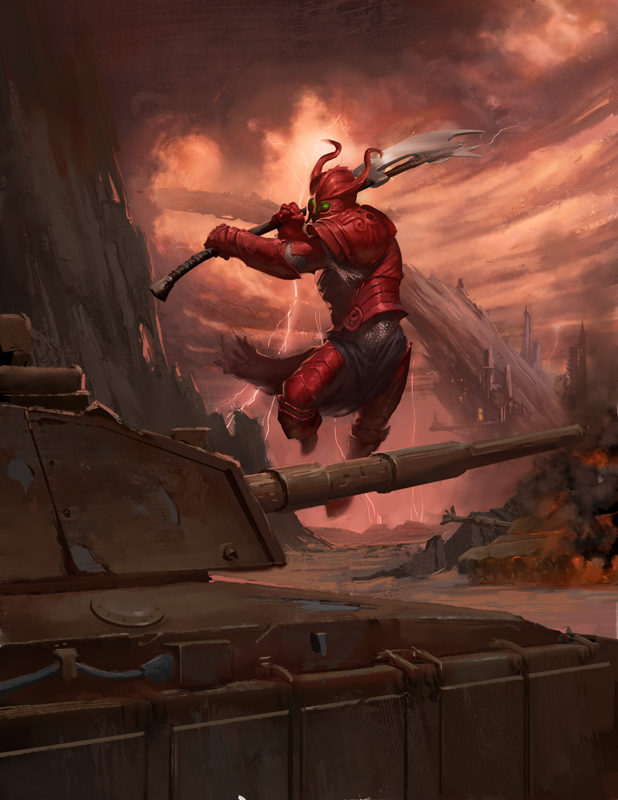 This supplement of new, advanced, and optional rules spans many forms of Aventurian magic. 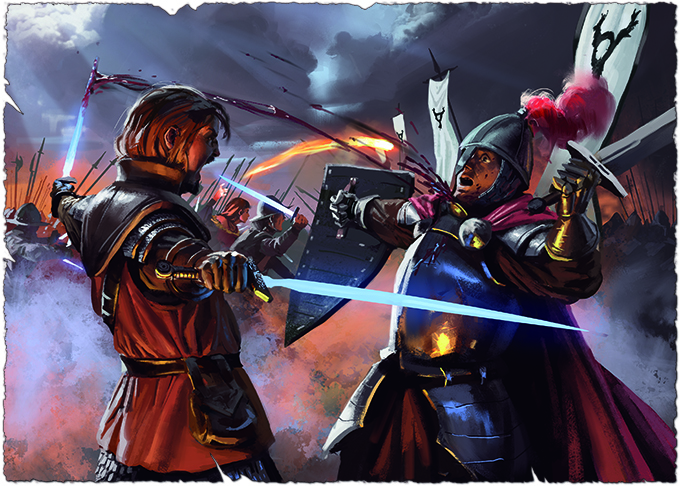 We introduce several new Traditions, including the special abilities and rules for each. These include magical dancers and magical bards, who produce magical effects via special dances and songs; illusionists, whom some call stage magicians; and magical dilettantes, the best-known types of which are the intuitive mage and the savant. Aventuria Magic arrives on Kickstarter Tuesday, November 13th! Bornland is not merely a former province of the Middenrealm. It was in days past the home of the famous Order of the Theater Knights. 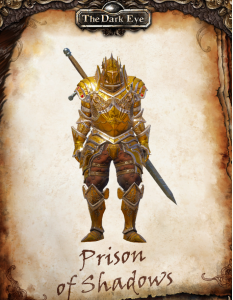 Today, little remains of the Order’s many towers and guard posts, but rumors say the knights’ legendary treasure and knowledge await rediscovery in the forests, rivers, and hills of the Bornish wilderness. 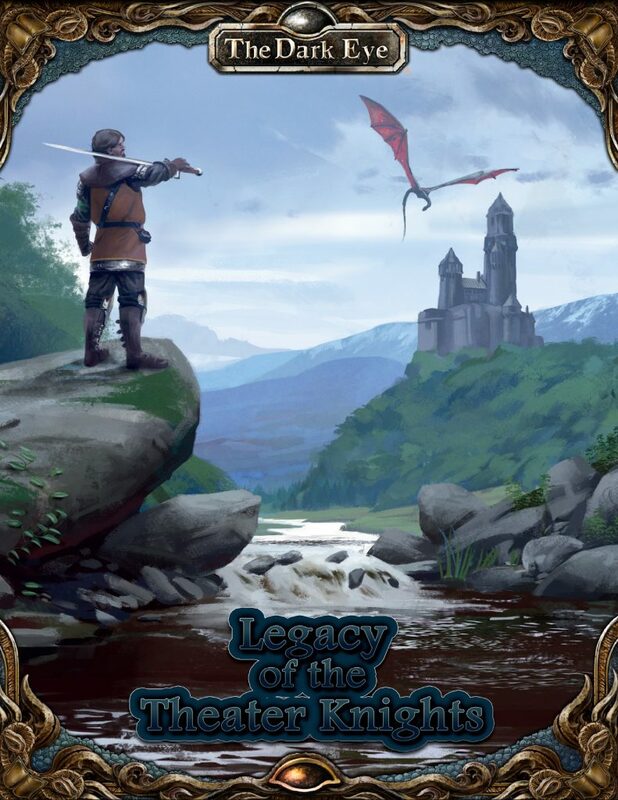 Welcome to the Legacy of the Theater Knights, one of the items included in the upcoming Aventuria Magic Kickstarter. This invaluable GM sourcebook expands upon the epic Theater Knights campaign, describing the region and its inhabitants in greater detail and providing tools to create exciting new encounters. 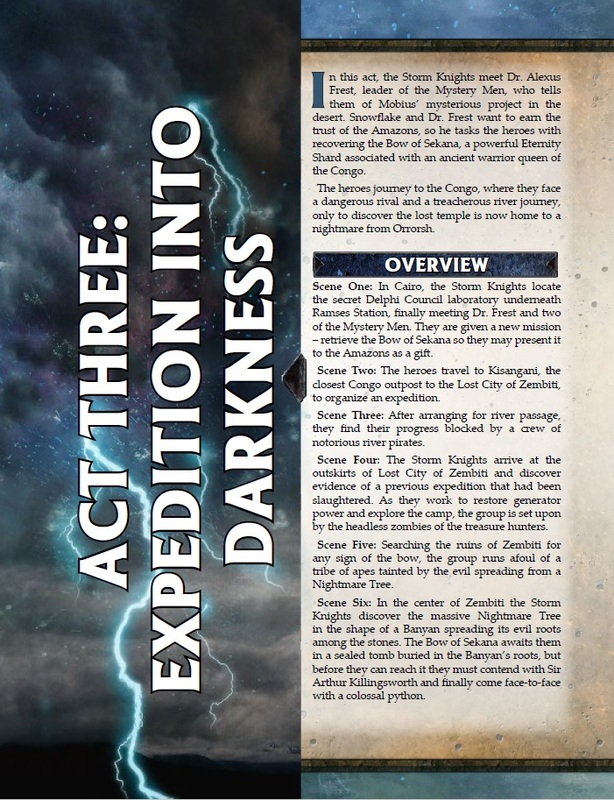 This 48-page product is not new to the English edition of The Dark Eye, but its format is. This was formerly the sourcebook that accompanied the Theater Knights-themed gamemaster screen in the German edition, and we are instead releasing it as a stand-alone product for your convenience. 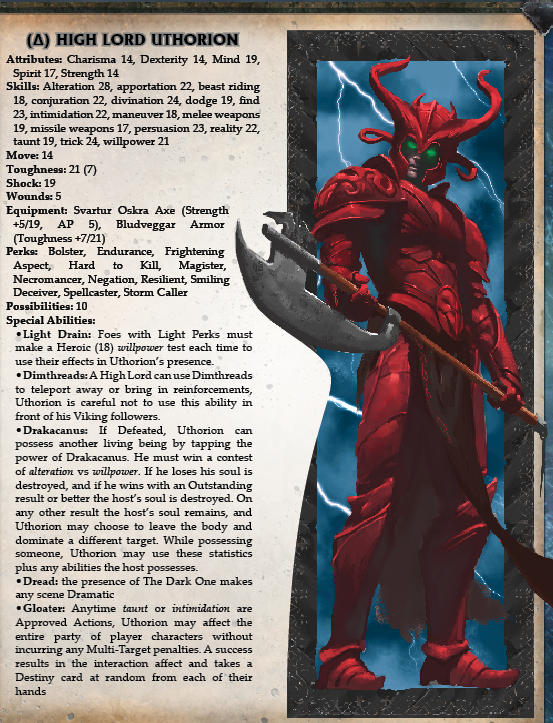 Be warned that the book contains significant spoilers for the Theater Knights campaign. But we wanted to make it available to anyone running those adventures as we enter the final stretch. 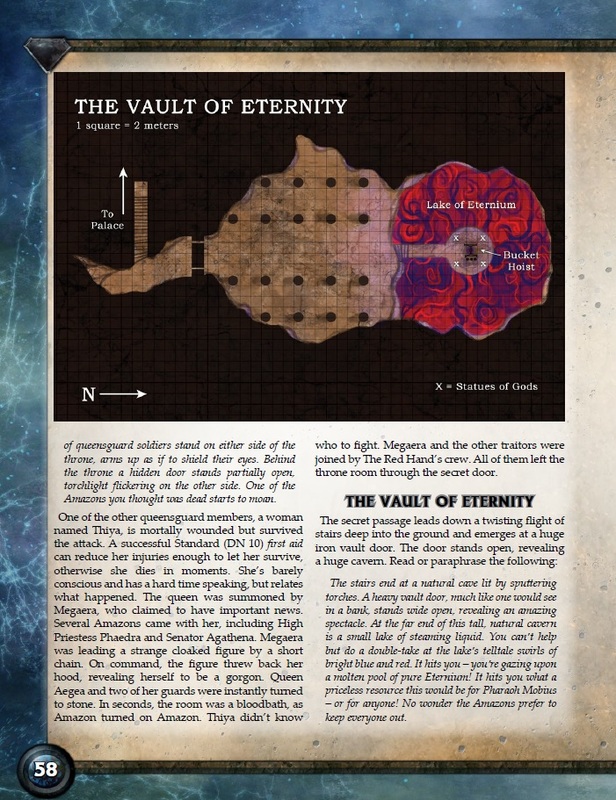 And of course, it’s a great way to keep up on current Aventurian events if you don’t mind knowing things in advance! 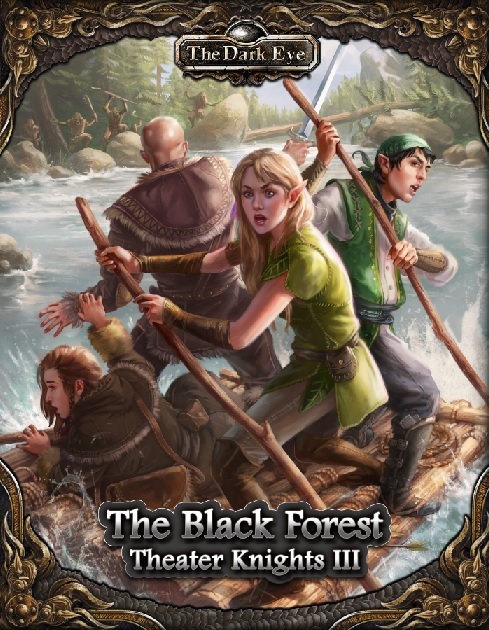 Legacy of the Theater Knights will be included with every reward level in the upcoming Aventuria Magic Kickstarter, launching very soon! Keep watching here for more information about this book and all the other rewards available in Aventuria Magic Kickstarter! Are you frightened of the empty room, or the prospect of what lies ahead? Either way, your churning stomach doesn’t seem to care. The small bowl of millet gruel you ate for breakfast is not sitting well, and you feel nauseated. Magistra Moonhair’s cooking might be to blame, but what if this is no accident. After all, she delivered your breakfast. Did she want to make sure you ate it? Does she hate you that much? So begins your day at the Lowangen School of Transformation, where you prepare to take your final exams. Fame and respect await all graduates, but a shocking crime threatens to end your character’s career as a mage before it even starts. Your choices help decide your character’s future. Can you unravel this fiendish mystery and still manage to graduate? 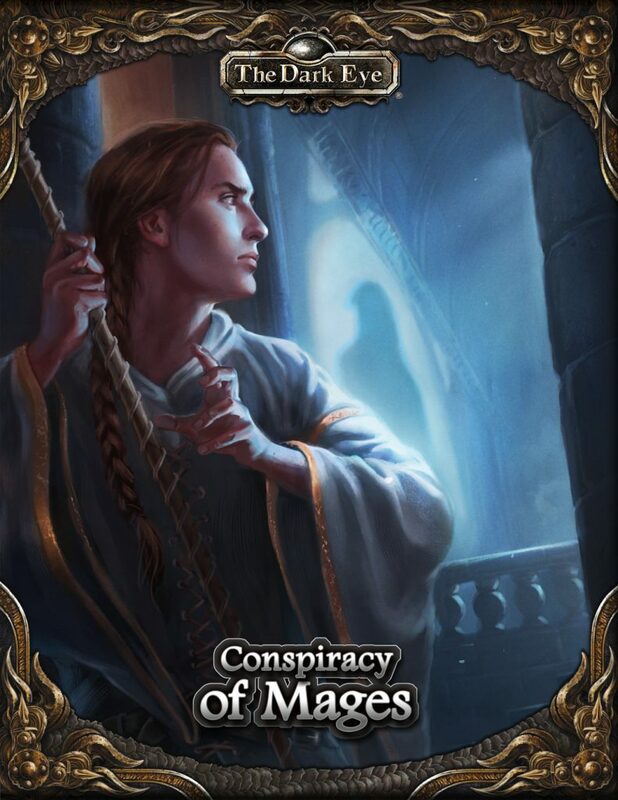 Welcome to Conspiracy of Mages, the next solo adventure for The Dark Eye! As with our previous solo adventure, Vampire of Havena, this book is designed to introduce you to the mechanics of The Dark Eye with a pre-generated character and careful explanations whenever you need to roll dice. It’s a great way for starting players to get into the system, and if you haven’t played a mage before, it’s a great way for you to learn all about spellcasting. Conspiracy of Mages will be included with every reward level in the upcoming Aventuria Magic Kickstarter, launching very soon! 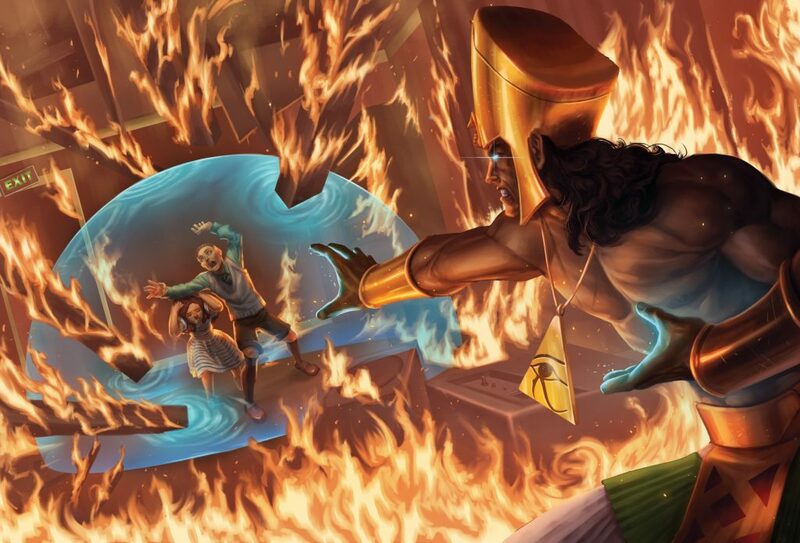 This week we take a look at the Nile Empire adventure the Fires of Ra. In this adventure, SOMEONE DIES! 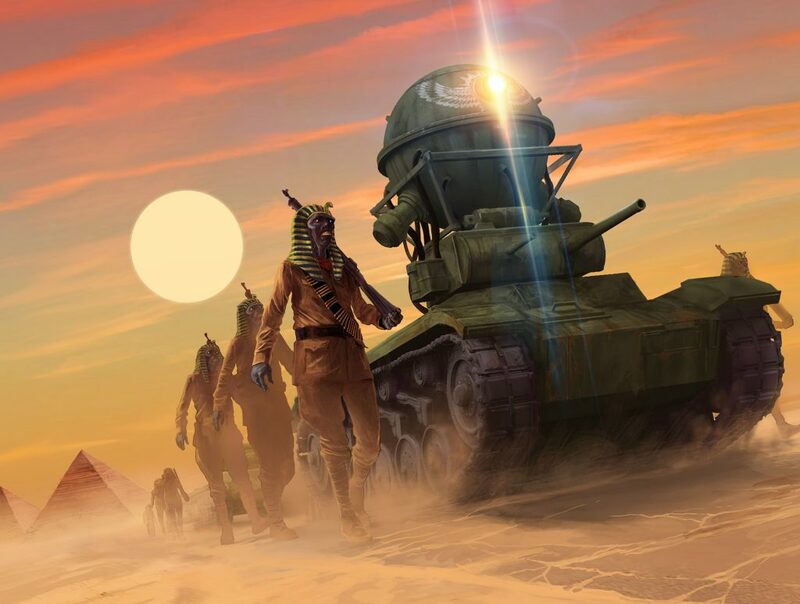 The Fires of Ra is a 110 page, seven act adventure where Storm Knights will travel across the length and breadth of the Nile Empire encountering pulp villains, members of the beaten-down Mystery Men, and even Amazons! The adventure begins in Venice, when the Storm Knights are tasked to stop a pulp villain, the Hooded Cobra, from stealing an ancient canopic jar, one of a collection linked to a pharaoh from the Egypt That Never Was. However, as the stalwart heroes journey to Cairo, into the trackless wastes of the Sahara Desert, deep into the jungles of the Congo, the island of Hespera off the coast of Crete, to the capital of Thebes, and East Africa, the Storm Knights discover that the jars are just the start of a cunning plan that will shake the status quo of the region! Car chases! Rockets and robots! Monsters and mummies! Airplanes and Amazons! Storm Knights will deal with these obstacles and MORE!!! Sorry, I got carried away there. 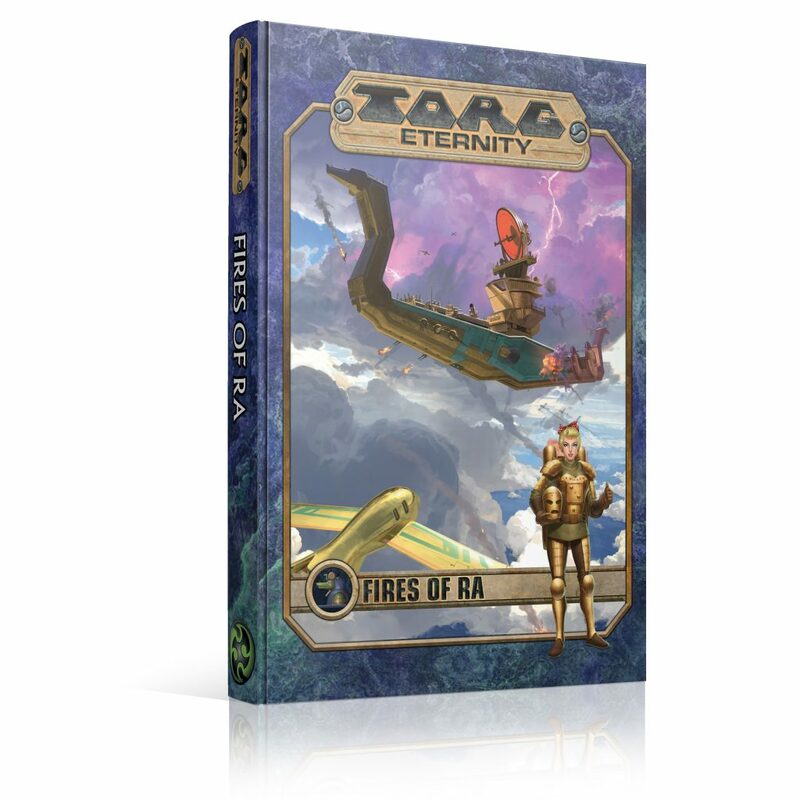 The Fires of Ra is written by Brian Reeves and Torg Eternity Line Manager, Darrell Hayhurst. 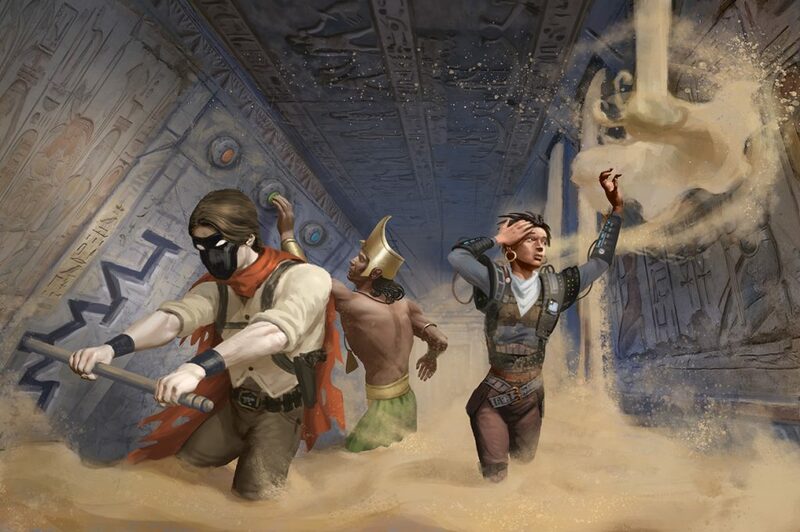 The arcane traditions introduced in the original Nile Empire were thematic but had two main issues: they were difficult to implement smoothly at the table and they played differently than magic did anywhere else in the Original Torg game. 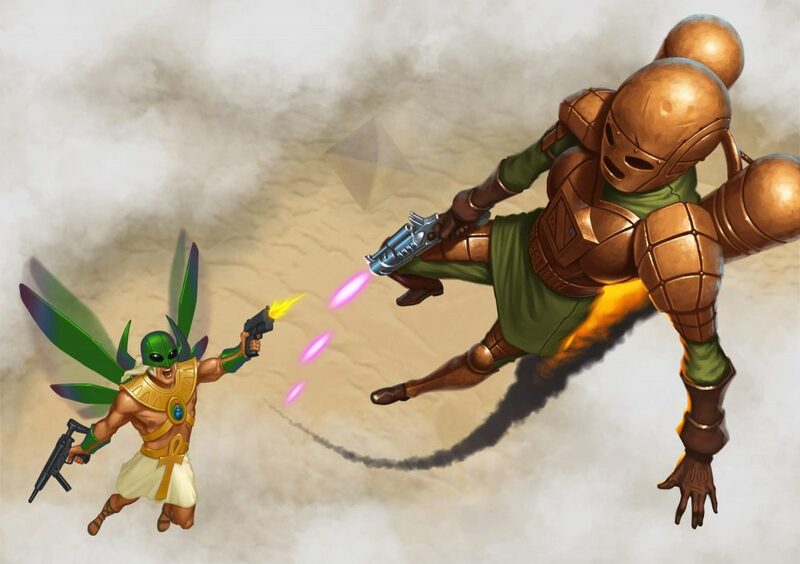 The goal in Torg Eternity was to make Mathematics and Engineering interesting and fun to play. Mathematics and Engineering (and “Egyptian Religion”) relied strongly on astrology which was extremely flavorful, but was time consuming to actually resolve. Each spell required a number of specific planets that you had to configure and each one had different DN and bonuses. Not something that should be the case in a cosm that has the Law of Action. This was an obvious place we needed to streamline, but I didn’t want to throw the baby out with the bathwater, and get rid of astrology entirely. 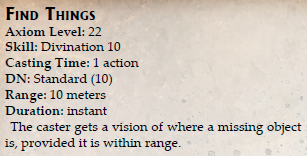 So we added the astrological flavor back in via Perks, like the Astrologer Perk, which modifies and improves the casting of certain divination spells. Additionally, astrology still has a place in the background. Just because we don’t have specific mechanics for every…uh…possibility, the alignment of planets can still be part of the story, associated with major rituals that can do incredible feats. In addition to not being part of the Aylish magic system involving arcane knowledges, Mathematics had different mechanics for backlash involving rolling on a Backfire chart, so that was something that wasn’t going to be included in Torg Eternity either. More problematic, Mathematics spells really didn’t have much in the way of ‘mathematics’ flavor to them, and in fact, many of the spells seemed better suited for miracles, and so many Mathematics spells became Amaatist miracles instead. In Torg Eternity, Mathematics becomes the ‘divination’ tradition. If you’re wanting to be able have a bunch of spells able to predict the future, this is your jam. Additionally, we played around with mathematic and physical concepts in creating some fun spells for Mathematicians to cast. Engineering had a different problem in that the spells were much more suited for a background or NPC role, rather than something Storm Knights would have and find useful in their adventures. Engineering became the tradition you go for if you like dealing with traps, finding traps, mapping places, and yes, even building things. Even though we focus on what players would find useful at the table, we do still include some mechanics on imbuing buildings with magic and miracles, and how someone can access them. Pulp Sorcery came along later in Original Torg, being introduced in the Terra Sourcebook. 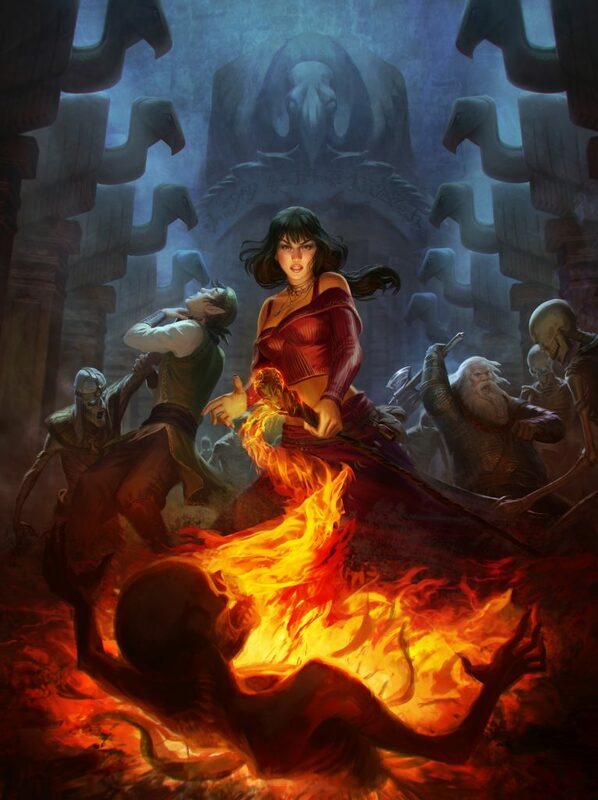 There, pulp sorcery was strictly based in the pulp powers, and while we did keep that as an element in Torg Eternity, we still wanted actual spellcasting to be a thing pulp sorcerers can do, and maybe even dabbling in a bit of both. 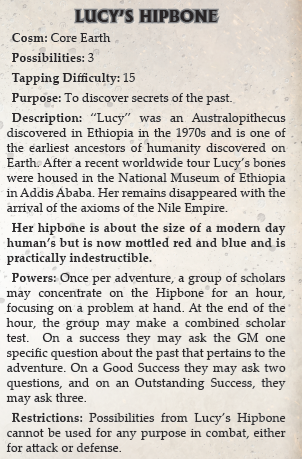 Pulp Sorcery ended up being the flavor of magic you could get by taking the Spellcaster Perk as a Nile Empire character in the Torg Eternity Core Book. Initially it was pretty basic, but in the Nile Empire Sourcebook we wanted to make it a bit more flashy and be something a more improvisational player could have fun with. 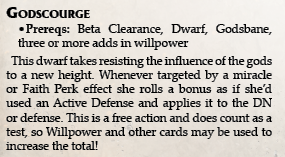 This comes in two ways: illusions and the Supreme Sorcery Perk. 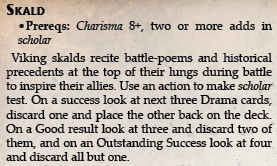 The exact trappings of illusions can tap into a player’s creativity, and the tough part was making it so that the spells could be resolved easily. 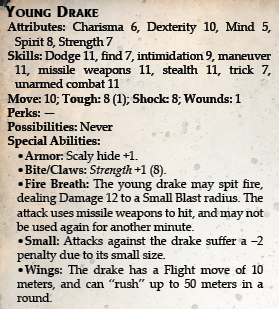 The Supreme Sorcery Perk requires a fair bit of investment, but once a character has it, he can theoretically (with the expenditure of a Possibility) access any spell he has access to, which allows advanced players an opportunity to play with spells they may otherwise not select. And yes, pulp sorcery certainly is inspired by a certain…supreme sorcerer. Although magic items do exist in the Nile Empire, we didn’t want to focus on them too much. First, that’s Aysle’s shindig, and we really try to keep certain tropes the domain of certain cosms. The other reason is that magic items are largely covered by mystic artifacts, which are essentially pulp powers. This way, they’re kept unique, and not as commodities like they are in Aysle. Finally we changed up the original “Egyptian Religion” a bit. First, obviously, we renamed it, finding that calling it by that name seemed generic and odd. We also wanted to connect the faith directly to Doctor Mobius, through his father. 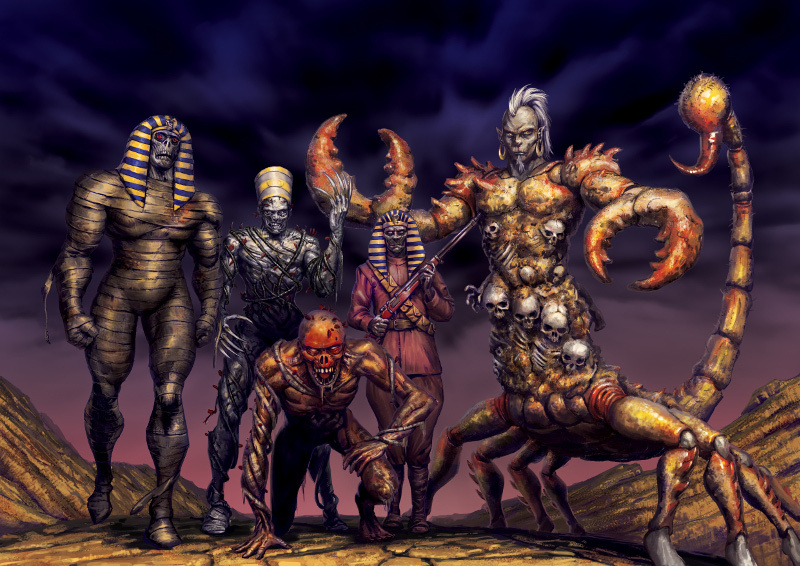 Additionally, given that Ancient Egyptian mythology has a lot of different interpretations through history, we were able to play with it a bit, instead making the pantheon and legends a bit darker, in that Osiris isn’t even part of it, having been killed by some of the other more evil Gods and his place usurped by them. Mechanics-wise, sacred animals are still a thing, and woe comes to those who kill a god’s sacred animal. As mentioned previously, many of the original Mathematics spells became the domain of miracles, but fans will see lots of the original miracles have their own versions here. Hey, how about a bit of a preview? I realized we haven’t shown any Eternity Shards yet, so here’s one! If you want to discuss any of these topics, please feel free to drop into our forums!